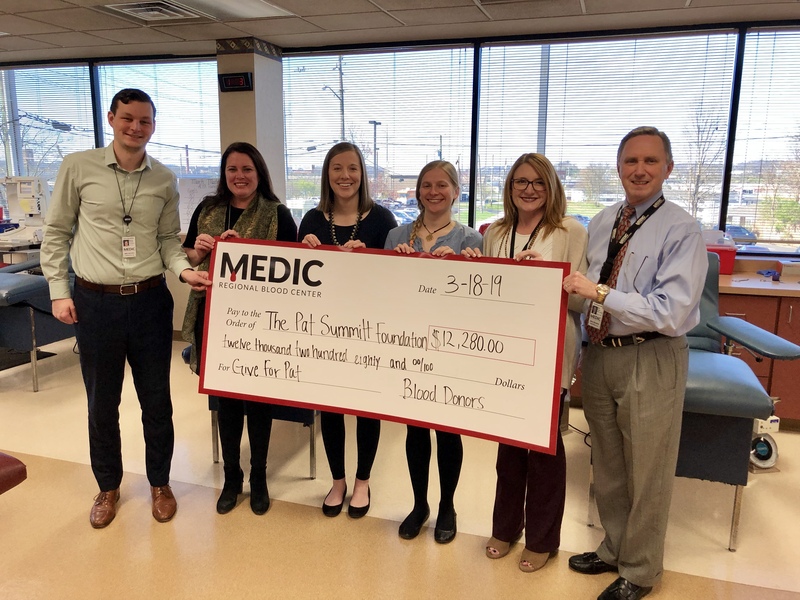 March 18, 2019 – MEDIC Regional Blood Center partnered with The Pat Summitt Foundation in February to support their mission of funding organizations engaged in patient care, caregiver support, and Alzheimer’s disease clinical research. Not only was former Lady Vol Coach Pat Summitt a blood donor, she was an advocate for MEDIC and the community blood supply. On countless occasions she worked to promote MEDIC’s mission and motivated her fans to roll up their sleeves. From Monday, February 4th through Friday, February 8th, MEDIC committed to donating $10 per blood donation to support Coach Summitt’s legacy. This year’s total donation was $12,280. Representatives from the East TN Foundation, Pat Summitt Foundation and MEDIC posed for a photo during the check presentation this morning. Pictured in the photo are (L to R):Darren Ellis, MEDIC; Sunny Biden, The Pat Summitt Foundation; Jessica Renfro, East TN Foundation; Ashley Siferd, East TN Foundation; Kristy Altman, MEDIC; and Jim Decker, MEDIC. MEDIC Regional Blood Center is a nonprofit organization and the sole provider of blood and blood products for 26 regional hospitals. MEDIC relies tremendously on blood drives set up at businesses, churches, schools and community events, which accounts for 85 percent of the blood collected. Established in 1958 by Dr. Carl Nelson under the sponsorship of the Knoxville Academy of Medicine, MEDIC is an accredited member of the American Association of Blood Banks and a member of America’s Blood Centers. For more information, go to www.medicblood.org. The Pat Summitt Foundation, a fund of East Tennessee Foundation, was established by Pat and Tyler Summitt in November 2011. Its mission is to award grants to nonprofit organizations that advance research for treatment and a cure, provide care and support for patients and caregivers, and educate the public about Alzheimer’s disease. To learn more please visit www.patsummitt.org, like the foundation on facebook.com/webackpat, and follow it on Twitter and Instagram @webackpat.